This creamy homemade ranch dressing recipe will become a family favorite. What makes this so wonderful, is when you want to make a batch, the dry ingredients are already mixed together. All you have to do is add the wet ingredients and place in the refrigerator to chill for a few hours. The recipe makes almost 2 quarts of salad dressing; works well to make only half of the recipe too. Salads taste so much better with homemade salad dressing. Offering the best homemade condiment recipes and more. 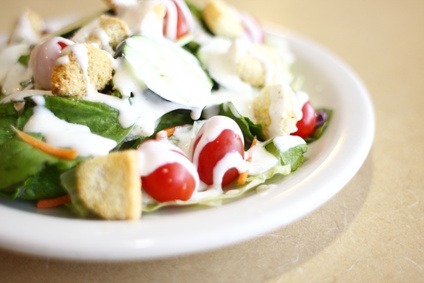 Be sure to check out more recipes for salad dressing at the end of the page. Mix dry ingredients together and store in a glass jar. Makes 3-1/2 cups dry mix. For lower fat and calories, you may use light or low fat versions. Whisk ingredients together and chill for at least 3 hours before serving. This makes almost 2 quarts of salad dressing. *If you do not have buttermilk, take a measuring cup and add 1 tablespoon of lemon juice or vinegar. Fill with milk, stir and let sit for 10 minutes. Now it's ready to use. SLOWLY add a thin stream of the remaining canola oil while the appliance is running until all is processed. Add the lemon juice and vinegar and whip until smooth and creamy. Store in a airtight container in the refrigerator before serving. One thing that is wonderful dunked in ranch dressing is potato wedges. I love ranch mixed with blue cheese dressing for chicken wings and of course it's the bomb on top of a fresh salad.